Our application is simple, yet very customizable. Find out how you can use it to improve your work. 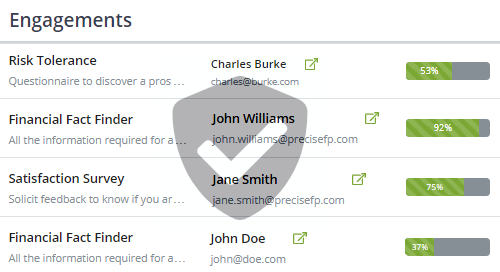 The profile stores your client’s data in easy to read customizable sections. 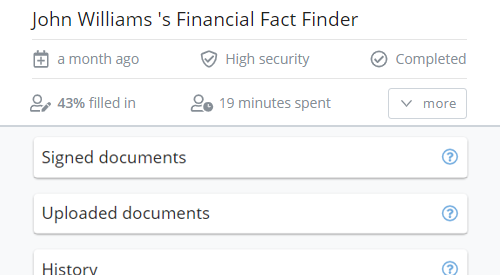 Tracking the latest data updates is a breeze thanks to our field highlights and revision history. 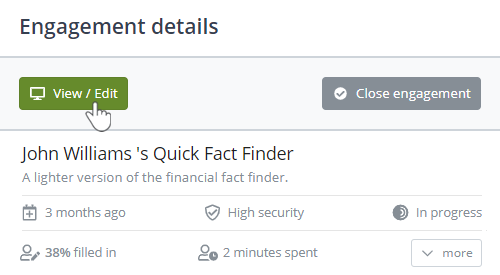 We track all activity performed on your client and prospect accounts. You are able to view what was done, when it was done and who did it, thus lowering the risk of litigation and/or corrective actions. The data quality score lets you know that KYC and other requirements are being met. And when your clients or prospects receive low scores, it’s easy to drill down and check exactly what is missing to address those deficiencies. 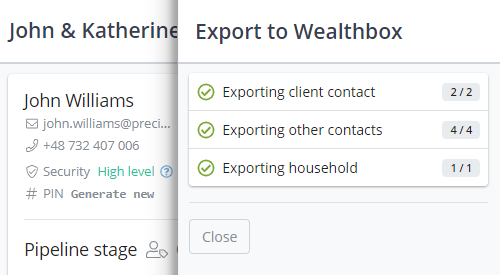 Importing and exporting data to our integration partners is super easy. Once you start, we give you feedback on the transfer and we let you know if anything goes wrong so that you can take a look at the account profile and resolve the issue. Pipelines are our way to set your clients and prospects on a journey. 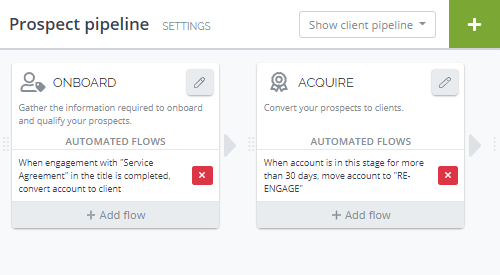 Each pipeline stage can have several automated workflows to move your clients along, or notify you to follow up with the right actions. There is no need to make separate requests to collect important documents. Your clients can upload them through their engagements, seamlessly. Additionally, if you want your documents in Google Drive, Dropbox or Box.com, we have you covered. Your clients don’t like to work on blank documents and that’s why we let you work on engagements alongside them. 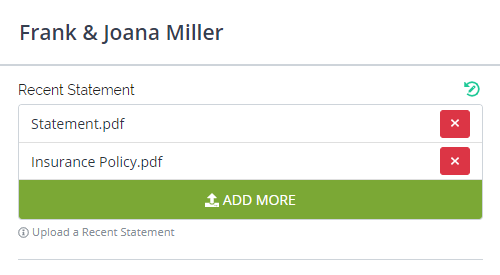 Additionally, if you need to print a copy of a completed engagement, you can do that, too. 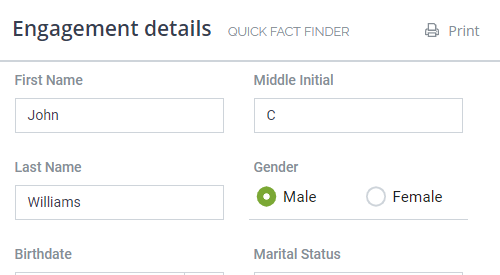 When possible, we pre-fill engagements with the latest client profile data. 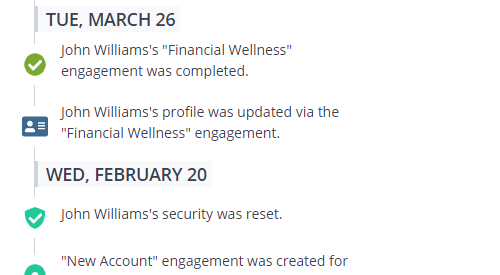 When engagements do not gather profile data, you can manually fill them in before sending them. That way your clients will open, review, submit and… be done! 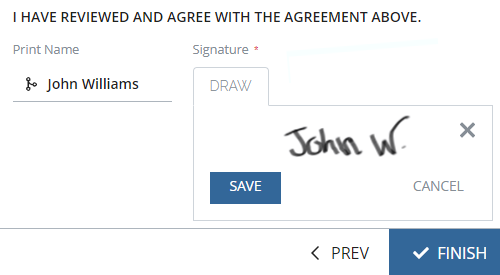 We support e-signature fields that let your clients electronically sign engagements. Never again will you need to ask your clients to print, sign, scan, and return documents that you need signed. With e-signatures, you can send advisory agreements, letters of authorization, and other advisory-related documents for your clients to sign. 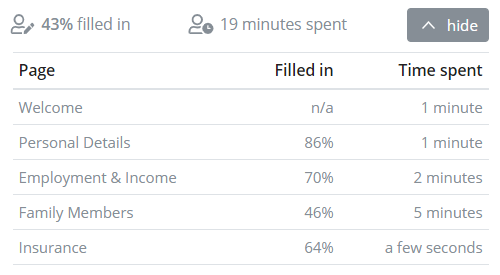 We calculate the time spent and percentage of filled-in fields on each engagement page. This allows you to track your client’s progress and gives you valuable insight on how to tweak your templates to increase their performance. Engagements can collect a large amount of data. That’s why we give you access to the most important information, without the need to sift through endless pages. From time spent, to percentage of filled in fields, to uploaded and signed documents, you get what is most important – all in one place. We provide you with reporting templates for the most common situations. 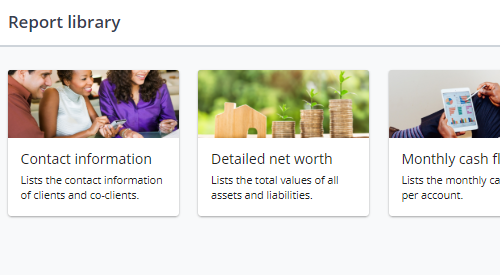 From contact information to cash flow and net worth, our reports provide an easy way to view information from all your clients. Reports can be exported to PDF for printing, or to XLS/CSV for further data manipulation. Customizing report templates and picking what data fields you wish to list is super easy with our report editor. Pick your columns, aggregate complex values, and you’re ready to generate results in a couple of minutes. 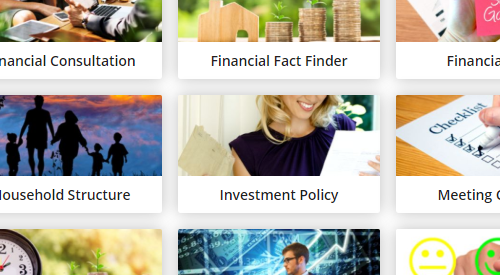 We provide a large library of templates created by financial professionals that are ready to be used as-is, or customized to your needs. Either way, you’ll find templates covering a multitude of topics that will allow you to engage clients on any topic. Our template editor allows you to design pages with input fields, images, videos, document uploads and a variety of custom components, all in an easy to use visual way. Advanced tools allow for your templates to adapt to your client’s input by including logic and calculations. And our themes let you customize the look and feel of your templates to match your own branding. 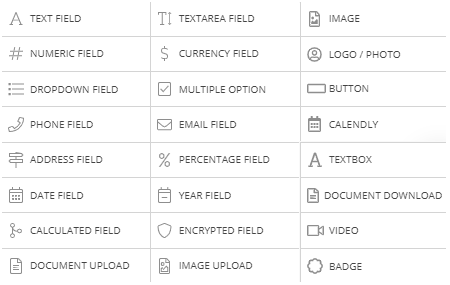 We’ve included over 20 different field types and elements. 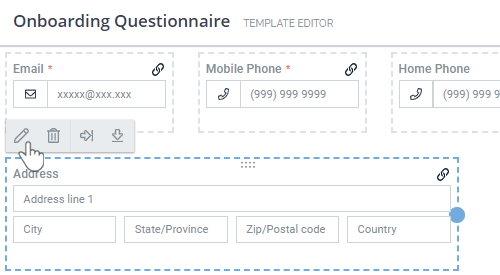 From a simple text field to a complex calculation, you will be able to gather any type of data from your clients. Our elements allow you to enrich your templates with text, images, documents, and even embedded videos. You can customize all email messages sent to your clients on each template or when you are creating a new engagement. 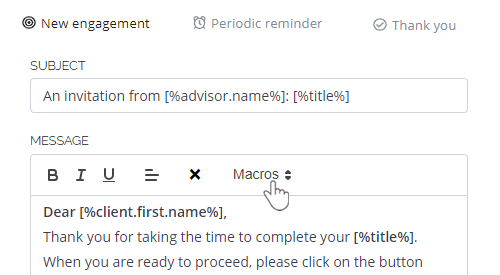 You can use macros to personalize the messages to each client and you can disable a specific message if it does not apply. Sometimes you want to gather non-sensitive information and there’s no reason to require a client password or security PIN to start with. Low-security templates don’t require authentication and don’t get pre-filled, making them perfect for surveys, contact capture, and lead generation. Published templates are a great way to gather new prospects. 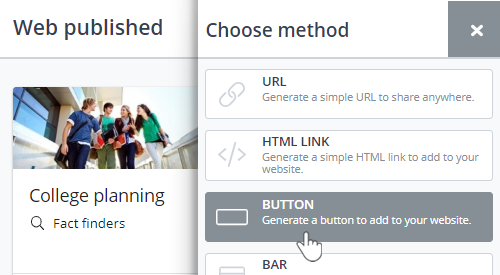 Just select the publishing options, copy the resulting code, and paste it onto your website. Once that’s done, you can fine-tune your lead generation templates and the changes will be automatically published for you. All of our traffic runs over 256-bit SSL encryption and we encrypt our databases and document storage using an AES-256 implementation. Your passwords and sensitive client data are encrypted once more and stored in a separate storage layer. 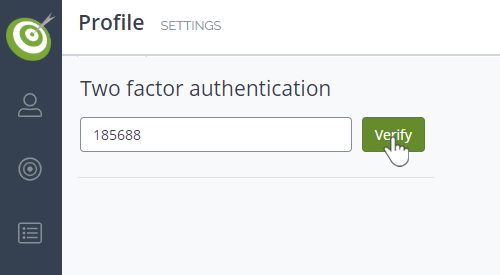 We provide two-factor authentication for user accounts. Once enabled, a security code will be sent via text message to your phone after you input your login credentials. Without it, accessing your account isn’t possible. 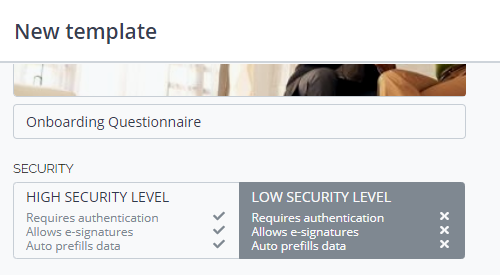 We can all agree that the social security number is probably the most sensitive piece of data clients entrust us with. That is why we encrypt it using our encrypted fields. 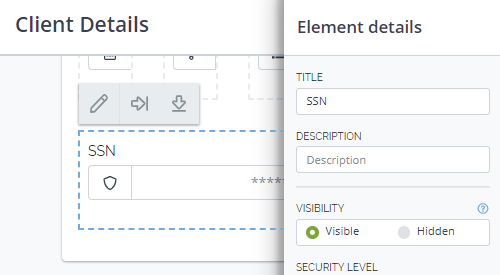 You can also create custom encrypted fields for any client information you deem sensitive. Built on top of our pipelines, automated workflows allow you to trigger specific actions whenever a certain event occurs. 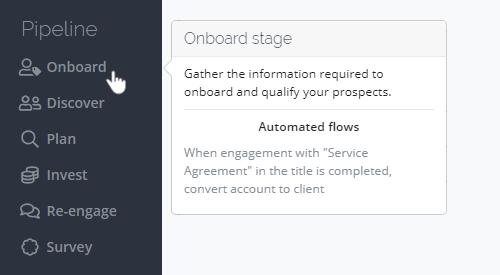 You can move your clients through your pipeline when they complete an engagement, convert a prospect to a client when they sign your service agreement, or engage clients for their yearly review automatically. The possibilities are endless. 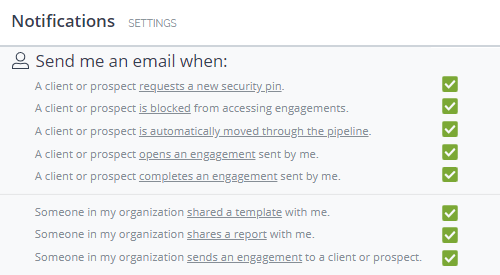 You are in control of what actions trigger email alerts sent to you. 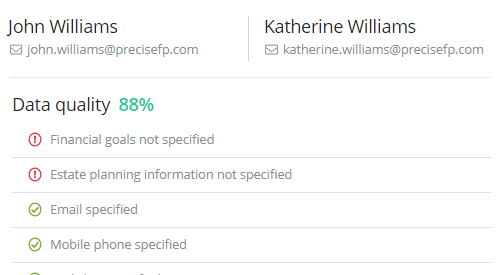 Get notified when a client completes an engagement you sent out, or when any client completes an engagement sent out by one of your colleagues. You can toggle notifications on or off at any time. 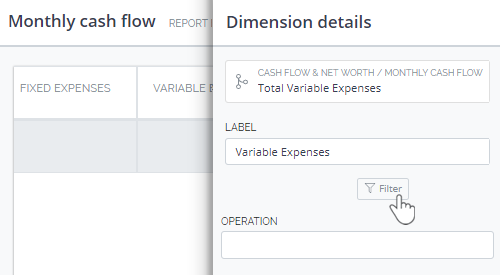 Controlling who can do what in your account is super easy. 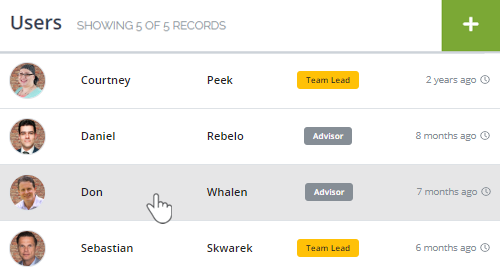 We give you role-based, granular control over user permissions and the ability to assign users to different teams. You can create unlimited teams, each with its own list of clients and prospects. 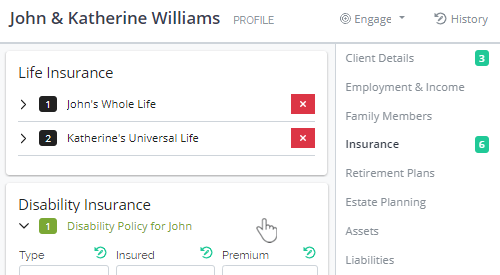 The dataset lets you configure the client profile to make it your own. 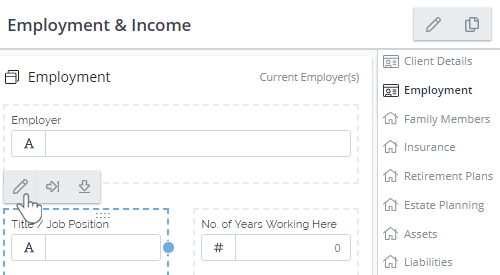 With our dataset editor, you can add or remove entire sections of the profile, move them around, create custom fields, and build a client profile that makes sense for you. Hassle-free data gathering. Try it for free. © 2019 Spectrum Input, LLC.